Although the general public may perceive cannabis to be the least harmful illicit drug, there has been a noticeable increase in the number of persons seeking treatment for cannabis use disorders over the past decade, particularly in the Americas, Oceania and Europe. 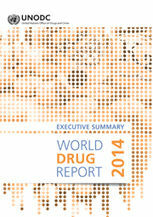 The World Drug Report 2014 and supporting documents. 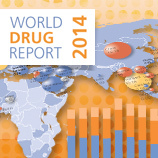 The World Drug Report from UNODC is now available in its 2014 version. Drug use prevalence is stable around the world, concludes the report. Around 243 million individuals, or 5 per cent of the world’s population aged 15-64, are estimated having used an illicit drug in 2012. The World Drug Report is published annually by the United Nations Office on Drugs and Crime (UNODC). It provides updated overviews of the major developments in drug markets for the various drug categories, ranging from production to trafficking, including development of new routes and modalities, as well as consumption. The Report and supporting documents can be downloaded at the UNODC web site here. Press release on the World Drug report 2014. Around 243 million individuals, or 5 per cent of the world’s population aged 15-64 having used an illicit drug in 2012. Problem drug users numbered about 27 million, roughly 0.6 per cent of the world’s adult population, or 1 in every 200 people. There continues to be a gap in service provision, as in recent years, only one in six problem drug users globally have had access to or received drug dependence treatment services each year. Although the general public may perceive cannabis to be the least harmful illicit drug, there has been a noticeable increase in the number of persons seeking treatment for cannabis use disorders over the past decade, particularly in the Americas, Oceania and Europe. Nonetheless, opiates remained the most prevalent primary drug of abuse among those seeking treatment in Asia and in Europe, as did cocaine in the Americas. Global cannabis use seems to have decreased, essentially reflecting a decrease in cannabis use estimates reported by a number of countries in Western and Central Europe. However, in the United States, the lower perceived risk of cannabis use has led to an increase in its use. At the same time, more people using cannabis are seeking treatment each year. The 2014 Drug Report also comments on the new regulatory frameworks in the States of Colorado and Washington in the United States and in Uruguay which now make the recreational use of cannabis legal under some restrictions: “It is too early to understand the impact of these changes on recreational and problematic use of cannabis and in the broad range of areas that they may affect, including health, criminal justice, and public revenues and expenditures. It will take years of careful monitoring to understand the broader effects of those novel regulatory frameworks in order to inform future policy decisions”. The UNODC Executive Director, Yury Fedotov, said in a comment to the report that sustainable success in drug control required firm international commitment. “A balanced and comprehensive approach addressing both supply and demand should be backed up by evidence-based responses focusing on prevention, treatment, social rehabilitation and integration. This is particularly important as we move towards the Special Session of the General Assembly on the world drug problem in 2016”, Mr. Fedotov stated. Mr. Fedotov also stressed that controlled substances should be made more widely available for medical purposes, including for ensuring access to pain medication, while preventing their misuse and diversion for illicit ends. In this year’s World Drug Report special attention is given to the control of precursor chemicals used in the manufacture of illicit drugs. The globalization of the chemical trade has made it easier to divert chemicals from legal to illegal uses. However, the control of precursors, the chemicals needed to manufacture plant-based or synthetic drugs, has tangibly curbed such diversion. "Monitoring global chemical flows is especially important with the rising manufacture and trafficking of synthetic drugs, which cannot be controlled with traditional supply reduction approaches such as crop eradication," UNODC Executive Director Fedotov commented. More about the new synthetic drugs here.